We have had a very eventful few months with regard to protecting our rights to private firearms ownership here in Australia. The law abiding gun owners of this nation have proven themselves time and time again that we are responsible and pose no threat to the community. We have been attacked from many different angles by the anti-gun groups, media and sympathetic gun grabbing politicians. We knew that the 20th anniversary of Port Arthur was going to stir up the anti's and the biased mainstream media. We fared quite well because we stuck to using fact and logical arguments to win the debate. Us as gun owners cannot control the mainstream media but we can become our own media. I am doing it right now by blogging away right here. There was an amazing presence on facebook and twitter that certainly turned the tables on the debates and online polls. We need to keep doing this to stay in front on the online debate, but we must also not forget to write letters and make appointments with our elected politicians so that they know exactly where you stand, and the votes they will lose as a result of you actively campaigning against them if they fail to represent your views..
We have a rare double dissolution federal election rapidly approaching. This means that it will take half of the votes that are normally required to elect pro gun senators in all states of Australia. I am not going to tell you or anyone how they should vote as I hope that you guys are able to do your own research and come to your own conclusions. I am lucky in the fact that my family are all gun owners and they know how to vote to help preserve their right to own guns. As I said previously, I wont tell you how to vote, but I am going to tell you how I am voting. I am a Queenslander and I will be voting for the Katter's Australian Party candidates in the upper house. I will then find the next best party, working my way through the list. I will place the 2 major party's 3rd and 2nd last, with the greens* dead last. Why the KAP candidates? Its simple. Robbie Katter & Shane Knuth have been the most vocal and supportive politicians in the Parliament of Queensland. I have been kept in the loop with regards to how these two gents have represented us, especially behind the scenes that most people don't get to see. If I was a NSW resident, I would be voting Liberal Democrats first. David Leyonhjelm has been one of the few voices that have stood up for shooters. He was instrumental in ensuring that the greens* senate enquiry majority report was in fact very pro gun. He has a zero compromise attitude when it comes to gun ownership. He is all in and not afraid to say it! Victorians have been well represented by Ricky Muir. Ricky even went so far as to make a video about the Adler shotgun to explain that it wasn't a rapid fire semi auto kitten killing menace to society. I believe that the Country Alliance also have a very good record on private firearms ownership. I would get in touch with both and then make up my mind based on the meeting. This is where my expertise on firearm friendly politicians that take a no compromise stance of private gun ownership ends. If I was living in the other states, I can only say that I would put the greens* last. There are a few other party's that are pro gun on the surface but they seem to have dropped the ball and aren't representing to the best of their ability. I do hope that they are able to rectify this and get back in touch with those that would support them. If they were to take an attitude more like David Leyonhjelm's, perhaps they would get a lot more support. So now to the giveaway! I feel its time I gave back to you, the readers that visit my blog. 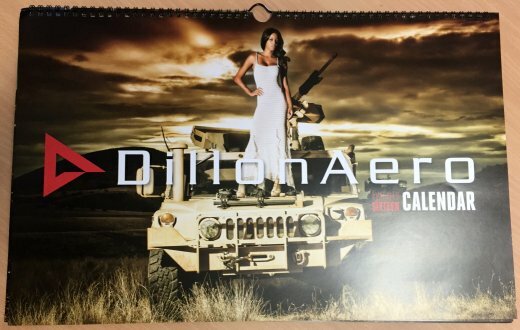 I have 3 x 2016 calendars to give away thanks to the great guys at Dillon Aero. 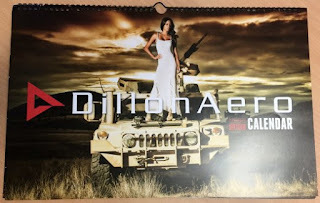 In case you are unaware, Dillon Aero manufacture the M-134D-H Miniguns that are fitted to the Australian Army CH-47 Chinook helicopters. These guns have been decisive in many firefights in Afghanistan. Word even spread around the Taliban to not shoot at the big helicopters with the white horses on them because they shoot back. In order to be eligible, like and share this post on facebook and/or twitter and I will select 3 winners at random at a time of my choosing. If you happen to click on one of the ads on this blog, it will help cover the cost of postage to the lucky winners......barely. * greens are not deserving of a capital letter.